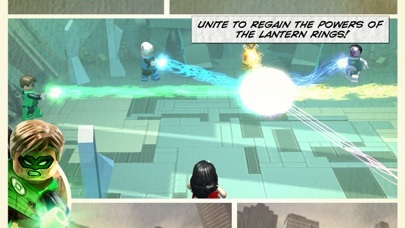 ***LEGO® Batman: Beyond Gotham requires iOS 8 or later and is compatible with iPhone 4S and iPad2 and later devices. 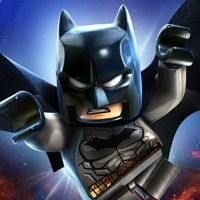 *** The best-selling LEGO Batman franchise returns in an out-of-this-world, action-packed adventure! 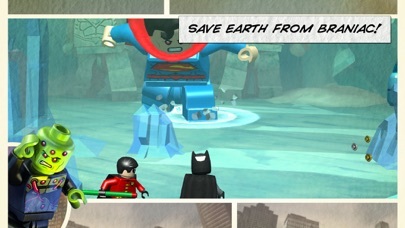 Play as Batman and join forces with characters from the DC Comics universe as you blast off to outer space to stop the evil Brainiac from destroying Earth. 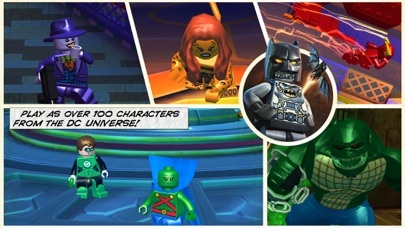 100+ PLAYABLE CHARACTERS Play and unlock more than 100 characters with amazing powers and abilities, including members of the Justice League, BIG LEGO Figures such as Solomon Grundy, Lantern heroes and villains, and much more. Note: all characters and abilities can be earned without additional purchases. 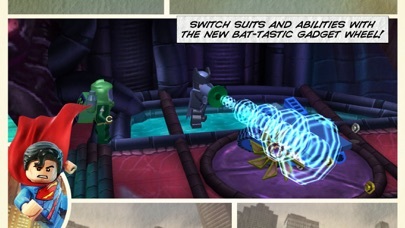 UNLOCK SPECIAL SUITS WITH UNIQUE ABILITIES Grant heroes even more powers with super suits such as Batman's bomb-igniting Demolition Suit, Robin's elite hacker Techno Suit, Cyborg's incognito Stealth Suit, and the Joker's tricky Decoy Suit. 45 MISSIONS BEYOND GOTHAM Adventure through an original story set in outer space and Lantern worlds that include Zamaron and Odym or visit familiar DC realms in the Hall of Justice, the Batcave, and the Justice League Watchtower. 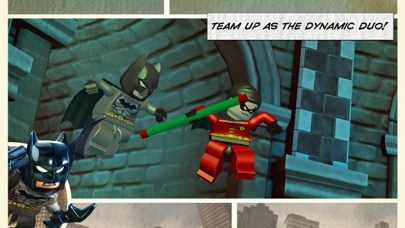 EVEN MORE CHARACTERS Collect fan favorite characters such as Batman Beyond, the Dark Knight, and Batman ’66 throughout the year with plenty more on the way (coming soon)! DYNAMIC CONTROL STYLES Switch between "Classic" and "Touch Screen" controls to find the play-style that suits you best. Good, but needs one more thing! I would really like it if you could do online multiplayer, especially like where you can join or invite people to play! For example, like Console Edition (CE), P1’s icon goes NW of the screen, and P2’s icon goes NE of the screen. And, like CE...P1’s icon is colored blue and P2’s icon is colored green, and then a tiny red icon that shows the boss. Please add this!!! So you gon tell me that I spent $15 on this app and can’t get my data back?? Crash’s after clicking level every single time. Need fix or I want a refund. Bigger hub world please Character customizer please That’s all I want Add these two things and I’ll stop complaining. Please?